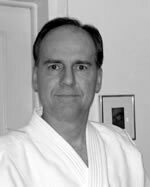 Following the death of Simcox sensei, Steve was appointed co-head, and later head instructor of Northern Virginia Ki Aikido. Since the age of 18 Steve has traveled around the world as a professional musician and he also maintains a busy schedule as a yoga teacher. Wolf sensei holds the Shinshin Toitsu Aikido rank of Godan and the Shinshin Toitsudo (ki development) rank of Joden. He is also a Qualified Assistant Examiner in Ki Aikido. Associate Ki Lecturer, Yondan, Chuden. Please see the website below for details.